This in no way mean the federal district court will reverse it either, but it does, however, guarantee that I will finally get legitimate review of this malicious, illegal conviction. Now the Arizona Court of Appeals is kind of backed into a wall: they cannot simply “deny review” of the currently pending petition for review in their court, as they, the Arizona Supreme Court, and Maricopa County trial court have repeatedly done throughout this two-year persecution. If the Arizona Court of Appeals does what I expected before today’s recommendation by Judge Aspey (which is deny the petition without review), it will leave open further federal review of all Arizona’s malfeasance and criminal behavior at every level of government. As we’ve pointed out, Sheriff Joseph M. Arpaio and former Maricopa County attorney Andrew Thomas are already being investigated by the feds. The final say in this matter will come from U.S. District Judge Mary Murguia, when she decides whether or not to adopt Judge Aspey’s recommendation and stay the federal habeas proceedings until the Arizona Court of Appeals issues a ruling. Next month will mark two years since the illegal, unconstitutional arrest I endured at the hands of the Tempe Police Dept. and their adulterer/lying leader, Chief Tom Ryff. A post-conviction relief petition, a special action petition, and a petition to the Arizona Supreme Court all have been denied without being reviewed by any of those alleged “judges” at all level of the Arizona judiciary. And of course, my first petition for federal habeas corpus was denied because I “did not properly exhaust state remedies” when it was filed back in April of 2009. So here we go again with a second federal Petition for Writ of Habeas Corpus, which I filed in the U.S. District Court of Arizona on March 1, 2010 (See PDF HERE). U.S. District Judge Mary Murguia, on April 7, 2010, ordered the State of Arizona to answer the claims contained in the petition, including several Sixth Amendment violations (right to public, speedy trial; right to self-representation) and several more Fourteenth Amendment violations, including judicial misconduct by Maricopa County judges Gary Donahoe, Teresa Sanders, David K. Udall, and Emmet Ronan (See PDF of the order HERE). After the State of Arizona was ordered to answer, I filed a supplemental brief (See PDFs here and HERE) and 140+ more pages of exhibits which clearly show several illegal, unconstitutional acts by Maricopa County/State of Arizona. Though the judge ordered that the Arizona Attorney General must ANSWER the petition and “not file a dispositive motion in place of an answer,” you can probably guess what Arizona did. Sarah Heckathorne, the attorney for the State, filed a DISPOSITIVE MOTION to dismiss the petition on April 29, 2010 (See PDF HERE) without answering any of the claims. They claim I failed to exhaust state remedies, which in their minds is why the petition should be dismissed. What many Americans don’t realize is that the reason it is now so difficult to get a federal judge to review a malicious state conviction is because of Oklahoma City bomber Timothy McVeigh. President Bill Clinton signed into law the Anti-Terrorism and Effective Death Penalty Act (AEDPA) of 1996. The baby of then Speaker of the House, Republican Newt Gingrich, AEDPA made it a legal, accepted practice for state governments to create a circus of appellate hoops defendants must jump through (“exhaust”) before a federal judge, via habeas corpus, can review obvious, blatant, unconstitutional, illegal acts by a state’s judiciary. In a series of bad legislation signed into law by President Clinton (also see NAFTA and today’s illegal immigration problems), AEDPA destroyed every other Americans’ right to due process – including people like myself who never have and didn’t hurt anyone, take any property, or damage any property. A maniac murderer bombed a federal building in Oklahoma and killed over 150 people. So now all habeas actions are limited to one year. AEDPA is simply knee-jerk, irrational legislation, similar to George W. Bush’s Patriot Act, which places the rights of American citizens in a toilet full of feces. Speaking of not hurting anyone, many of you know I was first charged with aggravated assault with a deadly weapon and several other major felonies by Tempe Police. I was then convicted of disorderly conduct (without a trial) by Maricopa County. But here’s where AEDPA hurts people. First, Maricopa County, via prosecutor Lynn Krabbe and Pansy Andy Thomas, said I allegedly hurt “multiple victims” in these alleged crimes. However, the Tempe Police clearly stated in their report that there was ONE alleged victim in these alleged crimes (see police report here). But finally, after I served a year of probation and did 224 hours of slave work (which they call “community service”), Maricopa County finally admitted on the court record that there were in fact NO ALLEGED VICTIMS in these alleged crimes (bottom of page 4). But because of AEDPA and Arizona’s kangaroo appeals processes, truth may never be reviewed by a federal judge. Maricopa County truly believes it will get $2000+ from me for “fines” and what not. I’d advise their little government not to hold their breath. The only hope people like myself have is that the federal judges who oversee these habeas petitions review the merits of each case and decide from there. I would expect, at worst, the U.S. District Court will stay the habeas proceedings until the Arizona “Court of Appeals” submits its pre-determined “denied without review” disposition for the pending appeal I have in there. Hell, even that Maricopa County attorney androgyny (Andrew Thomas) spilled the beans about HIS OWN courts, when he confirmed that decisions made by the Arizona Supreme Court have “pre-determined results.” Regardless, the fight against the criminal syndicate government of Arizona will continue, but I won’t expect much. And now we’ll turn our attention to my federal lawsuit vs. Maricopa County, Sheriff Joseph M. Arpaio, and Detention Officer Darren “I love men’s genitalia” Dauch. Instead of this thing being a legitimate forum for litigation, it has turned into a personal crusade by Maricopa County’s counsel, Sherle Rubin Flaggman, against my writing and her depending on U.S. Magistrate Judge Lawrence O. Anderson to help her through this case. There’s always been some truth to the stereotypes that “blacks” like fried chicken and “Jews” are good lawyers (Flaggman uses her “Jew” status frequently to get favors from Anderson). The previous, as it pertains to me is spot-on; the latter as it pertains to Flaggman probably has resulted in disappointment from her brethren not only back in that Euro-British-American colony they call “Israel,” but among her fellow lawyers as well. But I must say, this Flaggman has been the entertainment I’ve needed throughout this persecution. Several times since I filed this lawsuit last year, Flaggman has repeatedly referred to my “blog” as evidence of…well, I’m not quite sure. Her humorous antics went as far as her “telling on me” to Judge Anderson, in a whiny brief which complained because I said she “needs to get laid” and that “the only thing she has going for her is…” her cute paralegal/legal assistant in the above-linked “Rule 16” blog entry. (see PDF here). Flaggman went as far as to ask her friend Judge Anderson to sanction me for practicing my First Amendment rights. Regardless, as I predicted, interesting times have resulted from Flaggman and former Maricopa County judge-turned federal magistrate Anderson. Flaggman filed a motion to compel, which asked Judge Anderson to order every medical provider I’ve ever seen to disclose all medical records from my entire 35-years of life. My response to the motion to compel cites HIPAA (Health Insurance Portability and Accountability Act of 1996) statutes and Ninth Circuit Federal Court of Appeal precedent, which establish physician-patient privilege and privacy of medical records for private citizens. The problem with Flaggman’s motion is that she cited no legal authority to back her desire to raid 35-years of my medical history, so Judge Anderson ordered that she provide some/any legal authority in a supplemental brief or the motion would be denied (see Anderson’s order here). Flaggman filed her supplemental brief (see PDF here), which again, provided no legal authority backing her desire to raid my 35-year medical history, as I outlined in my reply brief. Regardless, Judge Anderson acknowledged that Flaggman provided no legal authority in her supplemental brief. But he granted her motion anyway, and provided obsolete legal authority from 1995 backing his decision (see the order here). I’d have no problem with Anderson’s decisions if they were legally and otherwise correct; and if Flaggman actually argued the points that Anderson made FOR her. Regular Americans can only hope a judge will be on our side like that. The only good thing about this is that I’m now forced to learn how to file interlocutory appeals with the Ninth Circuit, since Judge Anderson, in my researched, rational opinion, again, provided obsolete legal authority for his decision, failed to properly and fully adjudicate my motion for sanctions as required by Federal Rule of Civil Procedure 11(c), and overstepped his authority as the “impartial decision maker” a judge is supposed to be. I outlined this in a emergency stay motion in the Ninth Circuit, but I totally forgot to put the jurisdictional statement in there (why the Ninth Circuit has authority to hear the appeal), so I have to file that soon. So today, Flaggman will get to interrogate all my medical providers, which again, I don’t really care about, but its against the law, so I simply expect the law to work (which we all know does not in Arizona). Because of this, and the fact Maricopa County and the State of Arizona do not mind destroying innocent, hard-working people’s lives (such as myself…sans the “innocence” in a social sense), it’s only fair I did an extensive background investigation into Flaggman too, since she’s defending this Arizona criminal syndicate. And my Spider-sense was correct…this chick DOES need to get laid, and now its obvious why she acts the way she does. 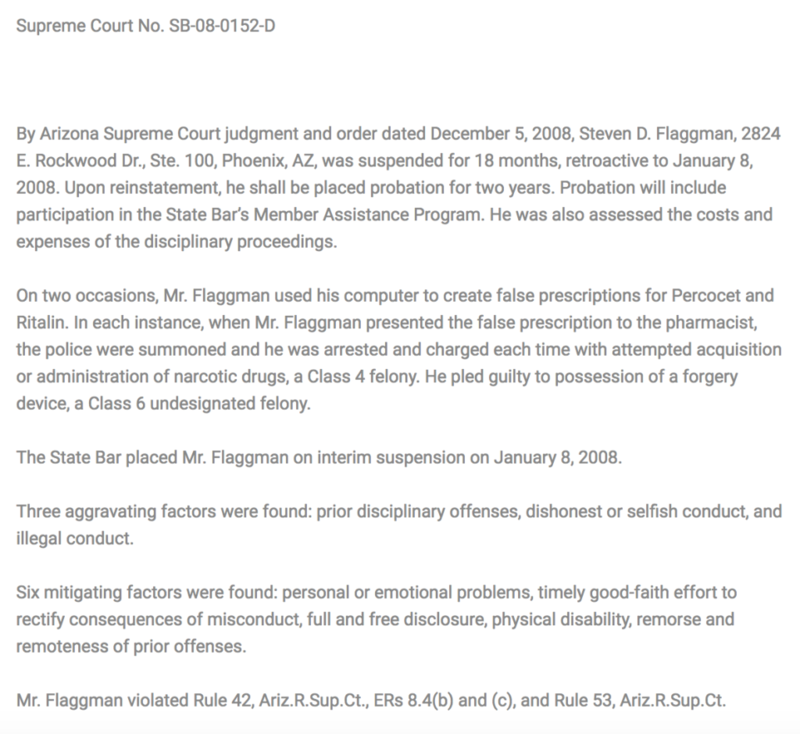 Though I’m not sure whether or not they are still married, Flaggman’s [ex]-husband, Steven Daniel Flaggman, who WAS a real-estate lawyer, was obviously the spice in the Flaggman household, and has enjoyed the privileges of being the husband of a Maricopa County attorney. According to court records, Steven Flaggman, who is from Michigan just like Sherle, was convicted in Maricopa County Superior Court of “criminal possession of a forgery device,” a Class 6 felony in October of 2007 and sentenced to 3 years probation. Then while on probation, in September of 2008, Steven Flaggman was charged and convicted again, this time of “attempted acquisition or administration of narcotic drugs,” a Class 4 felony. According to the Arizona State Bar, Steven is a pain-killer and Ritalin addict. This dude is a repeat felony offender who committed the second felony while on probation. He would have gotten five years in prison if any of the demographics related to this case were even slightly different. The Michigan State Bar also suspended Steven’s law license until at least 2012. (see PDFs here and here). I guess Sherle is attracted to “bad boys” and somehow avoided being indicated in any of these criminal acts (she can probably thank pansy Andy for that…remember, the guy along with Joseph M. Arpaio, who are being investigated by the feds). It appears Stevey and Sherle have also been squabbling over child support, custody, and a bunch of other mess since 2005. According to court records, there is a status conference on August 10, 2010 at the Northeast Regional Court Center, 18380 N. 40th St. Suite 120 in Phoenix, regarding all kinds of nasty, messed up stuff that comes with the territory of a criminal family with kids. It will probably make for some compelling theater. Operation Nation will likely dispatch an EYE to report on Flaggman’s family case. We may also continue to follow Defendant Darren Dauch’s little family matters as well. According to court records, the Department of Economic Security is involved in Dauch and his (I think) ex-wife’s and children’s affairs. We’ll withhold comment until we get the actual court documents, but it appears this “officer” not only owes several attorney thousands of dollars, but also his ex-wife does not want him around his own children at all. But again, we’ll update this when the information gets to us. The chances of me winning the case vs. Maricopa County and Arpaio are slim, simply because I have no money. And the chances of this illegal, unconstitutional conviction being overturned is even slimmer because of Timothy McVeigh and the Oklahoma City bombing, even though the circumstances of me and the maniac bomber are apples and oranges. I’m sure Flaggman will use this article as an exhibit in an upcoming court brief, so I just want to say hello to Judge Anderson (who I haven’t lost TOTAL faith in yet); hello to Ms. April Demarbieux (the paralegal); and say that you Maricopa County people need to experience that Mea Culpa at some point. I may not have the power and money to make you people pay for what you’ve done to me and hundreds of thousands of others, but I’ll do my best to make sure people across the planet know who and what you are. Brian: you are such an inspiration, such a brave person. I’ve been following all this since 2008 and am waiting for you to be victorious. I just want you to know that there are people out there who look at you as a hero. Including myself. Like you’ve said, win or lose, what you are doing is important. P.S. That Maricopa County attorney Sheryl Flagman probably should be investigated by the feds too. What a suprise. another crooked attorney working for Maricopa County. I think all male Arpaio posse like to grab men’s balls though they did it to me to. That cartoon got me cryin!!! Knowledge is power and that’s what is necessary to make a movement. Keep on doing what you do! Read all the posts. WTF!